In recent months, I’ve written about highrise apartment towers in Center City, west of Broad Street, and in University City, that are under construction or will be very soon. I am pleased to announce a new highrise apartment tower is about to be built in Center City, east of Broad Street, on Walnut Street in the busy Washington Square West neighborhood. This new tower will have a mix of rental apartments and a hotel. 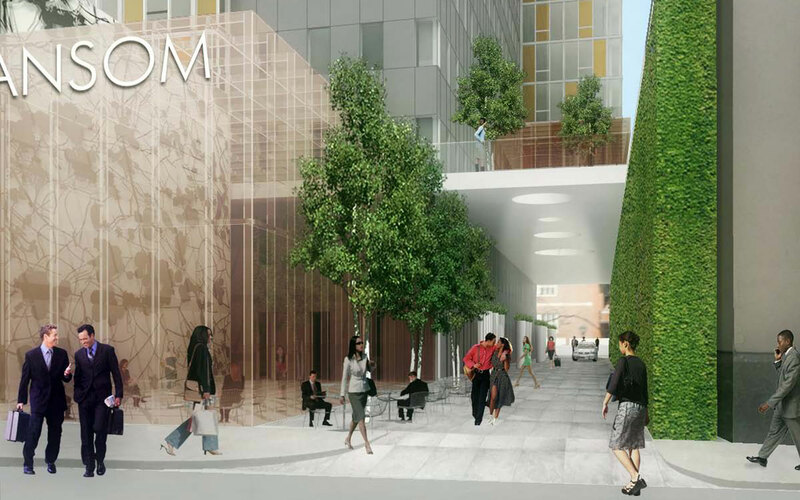 According to the renderings, the hotel brand may be the trendy mid-priced brand Element, although that brand is supposed to be in a new hotel project west of Broad Street that I will be writing about soon. 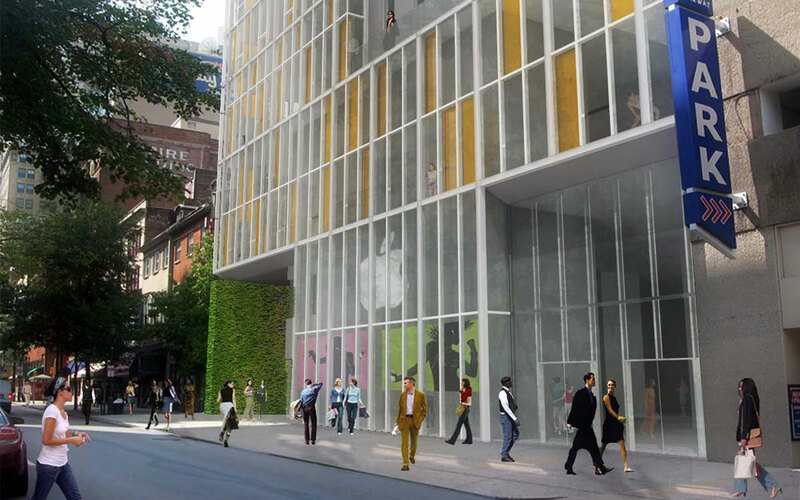 The new tower is being developed by U3 Ventures and designed by TEN Arquitectos. It is on the 1200 block of Walnut Street, at 1213 Walnut Street, on the site of a surface parking lot and the site of a recently demolished thrift store building, that had been vacant for a long time. It will be 26 storeys and 294 feet tall. The tower will be slender, with metallic sheathing, and will have two outcroppings from the tower covered in sleek, colored glass. The roof space will be utilized, with a pool on the roof of the base, a few storeys above the sidewalk. 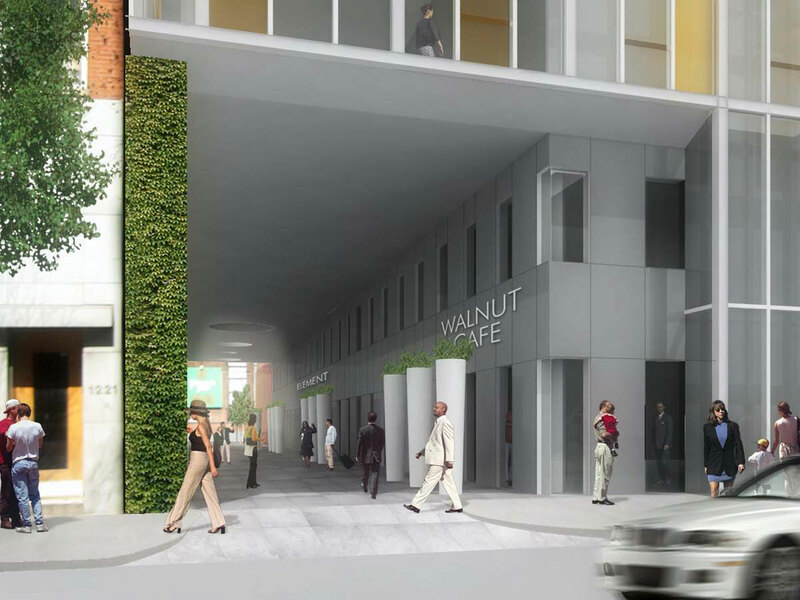 The ground level will have retail, likely a restaurant on Walnut Street and a smaller cafe on Sansom Street, and a driveway and walkway between Walnut and Sansom that will have separate entrances and lobbies to the hotel and the apartments. A neighboring business on Sansom Street, historic Fergie’s Pub, will remain on the site, next to the Sansom Street cafe. The ground floor will be covered with large glass-panel windows. There will be no parking in this building, since the surrounding neighborhood has ample available parking and it usually is not necessary to own a car in this area of the city. Some new buildings being built in the heart of Center City, such as The Sansom at 16th & Sansom Streets, have little or no parking in the structure as a way to discourage people from owning cars, where they are not very necessary, and encouraging them to consider alternate modes of travel, such as walking, cycling, and using abundant available mass-transit. This tower is easily accessible by the Route 42 bus, going west on Walnut, and the Route 21 bus, going east on Chestnut Street, and within blocks of the Market/Frankford subway line, the Broad Street subway line, and the subway/surface trolleys leading to West Philadelphia from Juniper and Market Streets. The regional rail is, also, accessible at Market East Station and Suburban Station, nearby, but numerous office buildings and Thomas Jefferson University and The University of the Arts are within a few blocks walk, as well. 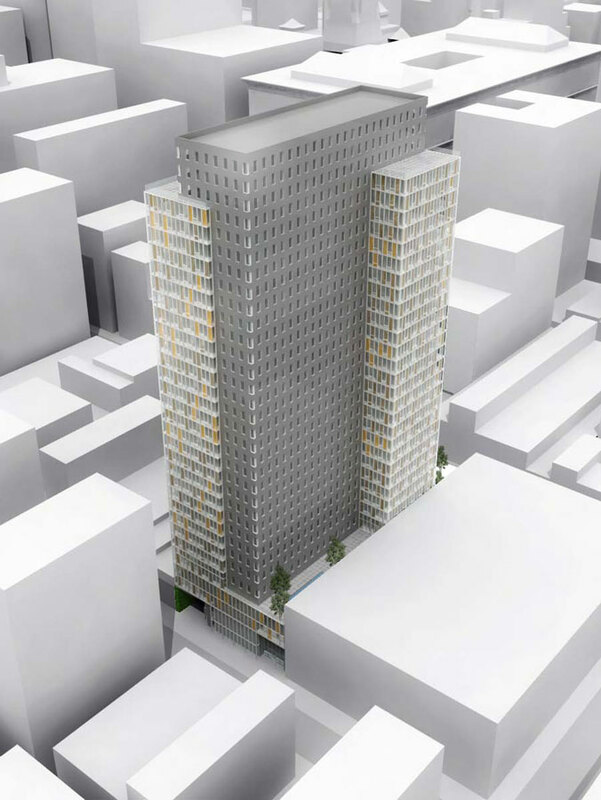 This building was first proposed in 2007 with a slighter taller, larger design, but after community opposition to the height and density, the developers and architects decided to make the tower shorter and with less rental and hotel units, and that was approved by the Zoning Board. Some neighbors were still unhappy with the height and sued to stop the development. They lost the first time and then appealed, but their appeal was rejected this past January, so the tower can legally start construction whenever they have all the financing and contracts signed. THE ULTIMATE REAL ESTATE NETWORKING EVENT! !